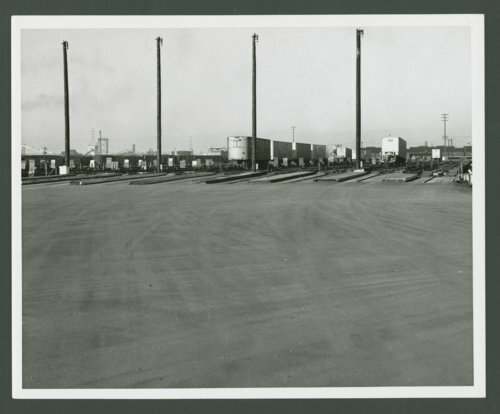 This photograph shows an unidentified Atchison, Topeka & Santa Fe Railway Company's circus loading facility. The term "circus loading" is used to describe an older method of moving trailers on to flatcars, (TOFC), whereby a truck backs the trailer up to a ramp placed at one end of a cut of cars. The loading process requires bridge plates to be at each end of all the cars to enable the trailer and tractor to pass from car to car. Atchison, Topeka & Santa Fe Railway Company's circus loading facility.